Why an EPACA Charter? – Watch the video! Brussels – 19 June 2015 – EPACA has over the past decade been at the forefront in promoting the highest professional standards for the Brussels public affairs sector. Launching the EPACA Charter is the logical next step in consolidating this work. 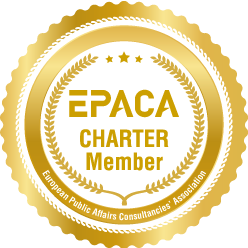 The Charter represents a ‘gold standard’ for public affairs, and aims at setting EPACA members apart from other public affairs agencies and at demonstrating to clients the benefit of working with EPACA consultancies.